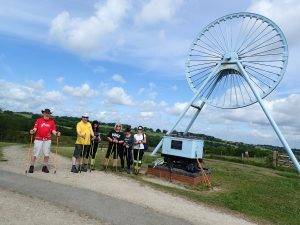 We’ll be teaching a new group of beginners the British Nordic Walking and INWA 10 Step technique in the Newcastle area, and trying out our new walking skills in the local Staffordshire landscape. 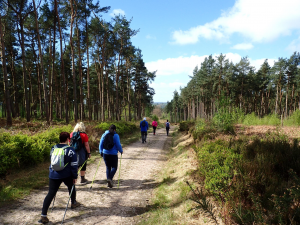 Following this ‘learn to walk’ course, participants will be invited to join our regular weekly walking groups. 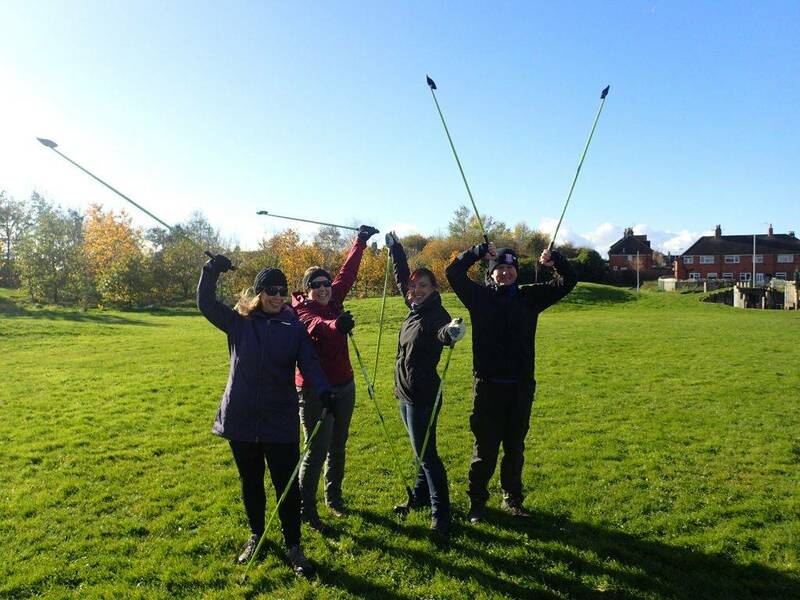 Details of the benefits of Nordic walking activities, can be found on our Nordic walking page. Day 1 Session 1 – 9.00am to 10.30am (technique), break for tea/coffee/snack, Session 2 – 11.00am to 12.30pm (walk practice in landscape). Day 2 Session 3 – 9.00am to 10.30am (technique), break for tea/coffee/snack, Session 4 – 11.00am to 12.30pm (walk practice, extended countryside walk). 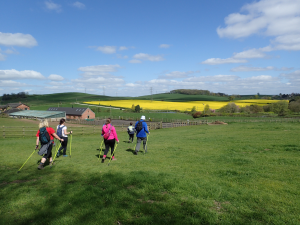 6 hours tuition including walking practice in total. Note – Sessions may be subject to postponement due to inclement weather. Alternative later local sessions would be offered in the event of a postponement. Meeting point details will be provided on booking. Please Contact Us to arrange booking and payment. (Places cannot be secured until payment is received). All participants will be required to complete a Physical Activity Readiness Questionnaire (PARQ), which assesses that your readiness to participate – which will be emailed to you. Participants are advised to read the form and assess their readiness to participate and to seek medical advice from their doctor (GP) if unsure (and we reserve the option to refuse participation if this is deemed inadvisable). Please add details of your height to the form, to allow the correct sized poles to be allocated. Trainers with a good cushioned sole and tread/grip to provide a foothold on outdoor surfaces (which can be muddy). 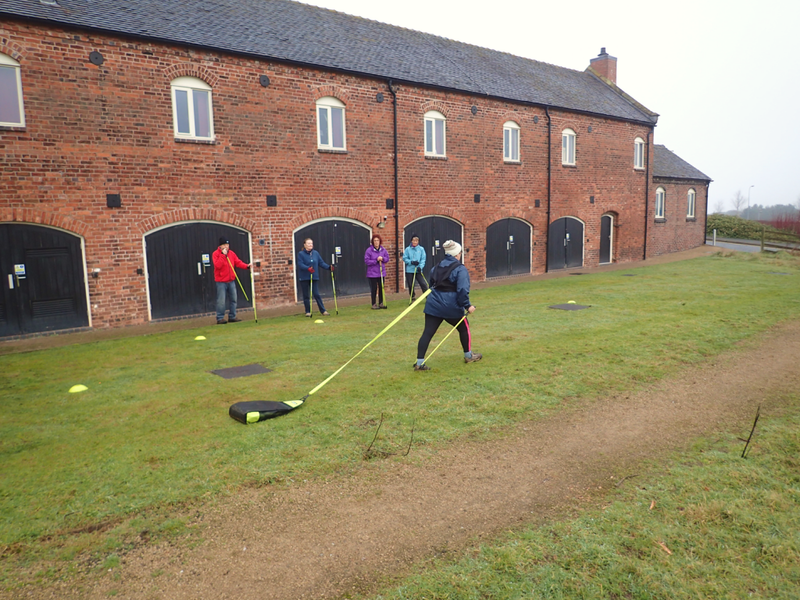 Waterproof trainers are advisable as we will be walking on grass some of the time which may be wet. Leggings or track suit bottoms which are close fitting around the ankles (flared trousers can inhibit walking with poles). Bottled water or alternative drinks, sufficient for all sessions. Bring a snack and each day. Any medication that you might normally need for physical activity. A small compact camera, if you wish to take photos. A small back pack to carry water, snacks and personal belongings. This should be small enough not to obstruct arm swing movement during the walking. Please mention the course to a friend, partner, family member or work colleague. We often find walkers enjoy coming along as a couple or with a friend.